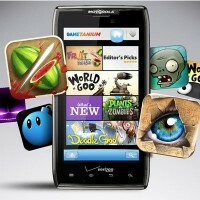 Verizon announced yesterday morning the launch of GameTanium, a exclusive app for Android devices on the carrier that will allow you to enjoy unlimited gaming, for a cost. Similar to Netflix but for mobile games, GameTanium will allow you for $5.99 per device each month to enjoy some of the biggest games out there such as Doodle God™, Fruit Ninja and World of Goo, while also trying out games you may be on the fence about. That’s $72 a year. Is it worth it? Customers are encouraged to try out the service with a free trial, providing unlimited access for three days. After the three-day trial, the service is $5.99 per month and will appear on customers’ monthly bill. The app is exclusive to Verizon and will work on both phones and tablets.